Kliknij na zdjęcie i przejrzyj wszystkie dostępne zdjęcia do Pousada Jardim dos Oliveiras. WiFi dostępne w całym obiekcie, bar, sprzęt do grillowania, transfer z lotniska, ekspresowe zameldowanie / wymeldowanie, przechowalnia bagażu, indywidualne zameldowanie / wymeldowanie, ogród, taras, taras słoneczny, wspólny salon / sala TV, codzienne sprzątanie, faks / ksero, pokoje dla niepalących, zakaz palenia obowiązuje we wszystkich pomieszczeniach ogólnodostępnych i prywatnych, klimatyzacja. Pousada Jardim dos Oliveiras is located in Paraty's Historic Centre. Free WiFi access is available, and a daily continental breakfast is served free of charge. Each room here provides guests with air conditioning. The private bathroom is fitted with a bath or shower, free toiletries and a hairdryer. Guests can enjoy the garden view from the room. At Jardim dos Oliveiras, guests will find a 24-hour front desk, a garden and barbecue facilities. 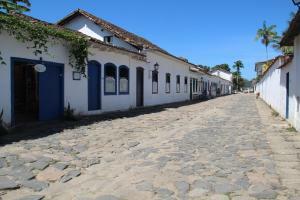 The guest house is 400 metres from Paraty Bus station. Please inform Pousada Jardim dos Oliveiras in advance of your expected arrival time. You can use the Special Requests box when booking, or contact the property directly with the contact details provided in your confirmation. Guests are required to show a photo identification and credit card upon check-in. Please note that all Special Requests are subject to availability and additional charges may apply. This property will not accommodate hen, stag or similar parties.